The parade consisted of every high school class float along with other student floats, such as the VH Cheerleaders, VH Band, Homecoming Royalty Candidates, and many more. All students not involved in the parade were dismissed at 2:30 PM to attend the parade. The parade started at the Blue Rapids gym and went towards the town square and back to where the floats started. Voted by community members, the class of 2020 won the float contest. The sophomores get a special privilege for the following week, such as being at the front of the lunch line for the whole week! This year’s King Candidates were, Harrison Blaske, Dalton Joseph, and Bryan Yungeberg. The Queen Candidates were Kayla Smith, Shea Manley, and Alli Jones. “It was exciting but nerve wrecking at the same time due to everyone watching me and the rest of the candidates at halftime”, said Bryan Yungeberg. The nominees are decided through voting by the student body. At halftime of the football game, the King and Queen were announced. Dalton Joseph was crowned Homecoming King by last year’s King, Hunter Stevenson. Alli Jones was crowned Queen by last year’s Homecoming Queen, Emma Tryon. Rounding out Spirit Week the Mustangs took the field and started with a booming first quarter scoring 20 points while holding the Patriots to 0. The second half the Mustangs came out strong again scoring 12 more points while holding the Patriots to 7. In the second half the Mustangs struggled to put points on the board but made up for it with stellar defense. The end of the third quarter score was 40-13 in the mustangs favor. The fourth quarter was another shutout quarter for the Mustangs defense putting up 6 points on the offensive end. For the third week in a row, the Mustangs got the “W” beating the Patriots 46-13. 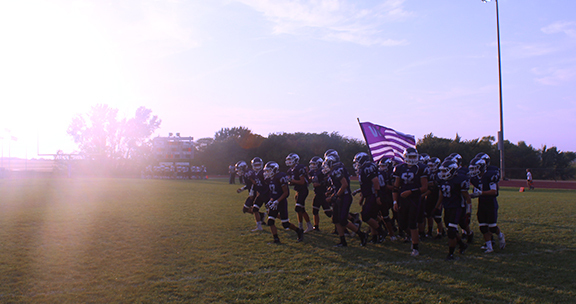 On Friday, September 22nd the Mustangs travel to Ellis to meet up with the Railroaders (2-1).